I may have the reputation of being a walking encyclopaedia, but I can assure you, there are shed-loads of things about which I know nothing. Quantum physics for example. Well, I can spell it. But that’s about it. And alchemy at the court of James VI and I. I don’t know anything about that — and in the main I don’t wish to find out. Not a fan of old James, me. The fellow gives me the creeps. I mean, think about it, all that drool…Blech. But it’s true. For this condition which has over the years been the source of much amusement, has now apparently made me the ideal choice as an editor for the soon-to-be published compendium, Castles, Customs, and Kings — which is a ‘best of’ collection of the first year’s worth of blogs on the increasingly popular English Historical Fiction Authors blog, a website on which, each day, an historical novelist (Barbara Kyle, Sandra Byrd, Nancy Bilyeau, and Judith Arnopp among them…) writes a bit about some of their research or historical events and people which interest them. It hits the shelves on the 23rd September 2013, this tome does, courtesy of Madison Street Publishing. And I’ll tell you an interesting thing. I’ve genuinely enjoyed editing it. I’ve truly enjoyed renewing my acquaintance with the various periods of English and British history which are not my specialisms and with which I had sort of lost touch. I’ve loved reading about mediaeval bathing and banqueting. I’ve loved learning about different unknown to the world places in England and Wales. I’ve been fascinated by the various individuals who have peopled this English stage over the centuries and I’ve loved how the authors have brought them to life for me. The sections range from Roman Britain all the way up to World War II…yes, there are gaps, I suppose. But whether your eye is fixed on the rival queens of Wars of the Roses or Jane Austen’s London or the languid Lady Mary of Downton Abbey — whether you just enjoy history or revel in historical fiction, this book, well…what I would hope is that readers would enjoy dipping in and out of the various periods of history by means of these essays, as much as I have. Below is one of the first reviews we’ve received on Goodreads for the Advance Review Copy, and I can’t tell you how chuffed I am that our collective work has been so well received. “Full disclosure: I received an advance copy and am writing this about 2/3 of the way through (I will update when I finish the book). I am also not a fan of historical fiction. I rarely read anything on the fiction shelf and even less of books that do not relate to royalty and the daily lives of their subjects across all eras and continents. “I opened the book expecting to find something akin to a conference proceedings without “trained” experts. Instead I found a new appreciation for the meticulous research and knowledge of the genre’s authors. “The book is divided into diverse subjects or historical periods. Each author has taken a topic and in a few pages given a succinct, well sourced overview. I find myself adding books to my wish list with every chapter. “The book itself first appears daunting in length. The short topic ‘chapters’ make it eady for on-the-go readers to read in small portions or even skip topics. The editors did a great job with transitions and order for each topic. Despite the length, there is no encyclopedia feel and each author’s voice is well preserved. So, the short and the long — I hope you’ll have a look at the new book, and I hope very much that you’ll enjoy it as much as we’ve enjoyed putting it together for you. This entry was posted in Book Reviews, Did You Know?, History and tagged Book Reviews, Historical Fiction, History, Jane Austen, Literature, Naval history, Writing. As interesting as it is, I learned the hard way , that it is a book strictly for reading while upright in a good chair during the day when I am wide awake. Maybe it is because I grew up in Iowa, USA and read about castles and kings, queens, etc., but the past has always fascinated me. Now I am learning why. I read a lot of historical fiction, historical mysteries and historical biographies and the articles on Archeology on Facebook and I am amazed how many things, people, have stayed the same, and yet a lot has changed, such as the industrial revolution and what conveniences we have in the modern age – computers, the internet, microwaves, freezers and refrigerators, washers and dryers, air conditioning, good medical care, etc. With the age of forensic pathology and the work posted on the Smithsonian Facebook page on the works going on in Italy by Professor Gino Fornaciari investigates a 500-year-old cold case, is searching the bones of a woman thought to have posed for the Mona Lisa and also testing bones of the Medic and Aragonese families, all this tells us what they ate, how they lived, their health and what they died from; pathogenes from then and what is known now can see how they have mutated over 400-500 years and I hope developed vaccines to help people. I still learn with each genre of historical fiction and it makes me head to the computer and use Google to search for more information. A lot of children don’t know how lucky they have it. To just sit at a computer and go off into cyberspace and learn all sorts of things we had no knowledge of unless we traveled overseas with our parents or were in a student exchange program or was lucky to be able to study abroad on a scholarship program. So to all the authors, no matter the genre, I salute you. You have taught me so much more than I would not have known otherwise. I reviewed Davies’ The Isles about a thousand years ago…it wasn’t nearly as good fun as his Europe: A History, which I’d loved. I go for a good suspense thriller mystery while trying to get to sleep. I have several modern day authors who write suspense thrillers and some of their books I have great difficulty putting down and then its only due to the fact that I am no longer able to keep my eyes open. I have Davies newer book “Vanishing Kingdoms” but haven’t even opened it. I have told myself I still need to work on his History of the Isles first. I haven’t read his Europe: A History. I did see the documentary by Simon Schama on The History of Britain and have the first two books he wrote that the documentaries were based on. I am disappointed we don’t get such good programs such as what I hear about from friends in England. I have wondered if it is difficult for American TV producers and networks to put on good history shows, yet Game of Thrones is doing well, so did Pillars of the Earth and World Without End. I do wish the BBC and other TV channels in Britain would work something out with our networks here. If our major networks won’t broadcast them, then maybe the cable networks would consider it. At least with a computer and the internet I can get information on some things. I just read a few days ago, the article on the Scottish Tapestry that is twice as long as the Bayeux and did catch a few glimpses of some of the panels. Just looked so lovely. I have many connections to the British Isles and I guess it is genetic memory that draws me back to stories, fiction or non-fiction. First of all, may I commend your excellent taste in books. I understand from the Madison Street Publishing that they’re trying to get the book up on Amazon for pre-order, though it’s not going as well as one would hope. That said, it will definitely be available on Amazon from the week of the 23rd September 2013–so a fortnight today. So–if you’re anything like me–write a post-it note with the title and the date to jog your memory on the 23rd…and I hope, I do so hope, you enjoy it! I’ll be honest, it’s got loads of cool stuff included in it! Thank for for your reply. I look forward to the books. I still maintain my position you are a walking encyclopedia, M.m., and a very generous one at that. You have helped countless authors with information on obscure matters, no doubt spending your time researching some of it. 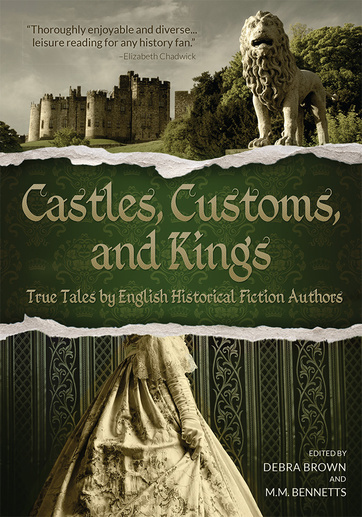 I, for one, am very excited about Castles, Customs, and Kings. Now, I will have an opportunity to read all the fabulous articles I’ve been unable to do daily because of time constraints. Kudos, M.m. & English Historical Fiction Authors! Sounds great. I’ll buy a copy when I can.